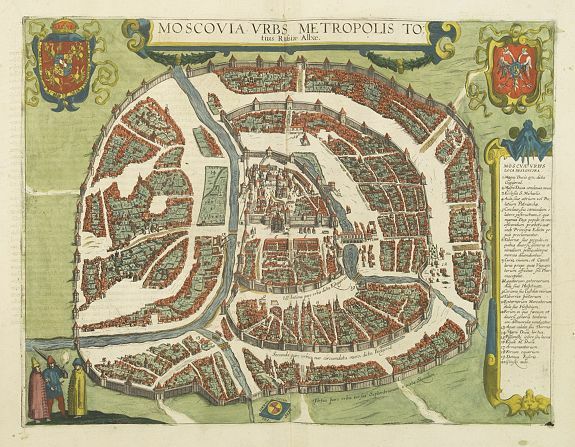 Old map by JANSSONIUS - Moscovia urbs Metropolis totius Russiae Albae. Title: Moscovia urbs Metropolis totius Russiae Albae. Size: 13.6 x 17.9 inches. Condition: A good and dark impression, very good to mint. French text on verso. Detailed bird's-eye town-plan of Moscow from Janssonius' rare townbook. With a key (1-20) to important spots in town. The verso has French text and originates from Janssonius town book of European and Asian cities (Theatrum Urbium Celebriorum totius…) published 1657. In 1653 Jansson acquired the nearly 500 plates of the Civitates Orbis Terrarum from Abraham Hogenberg, of which 232 were adapted and incorporated into the town books. A second state exists having persons and animals added in the streets, squares and around the city. The plan is believed to be derived from a Russian survey prepared at the orders of Boris Fyodorovich Godunov (c. 1551-1605), Czar of Muscovy from 1598 onward, and was probably prepared prior to 1630. The original Russian plan has apparently not survived, and Braun & Hogenberg may have used a copy made in 1610 for King Sigismund III of Poland. The plan shows the old city which surrounds the Kremlin and the Kitai Gorod or Fortified City. The name Kremlin first appeared as Kreml' (or High Town) in an account of the fire in the town in 1331. It was founded in 1147 at the junction of two rivers, the Moskva and the Neglinnaya. As Moscow grew, the Kremlin became the royal, religious and secular heart of the city. Until Czar Peter I transferred his seat of government to his new city of St Petersburg in 1713, it was the capital city. beyond the walls of Kitai Gorod, another section grew up, called Belgorod or White City, which was in 1584 after the death of Czar Ivan the Terrible with a wall which spanned 6 miles and included 28 towers. Reference: v.d.Krogt, Koeman Atlantes Neerlandici, Volume IV, 2863 42:14..